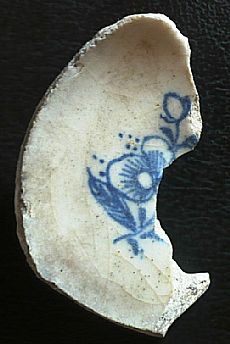 This is part of the base of a porcelain cup, probably dating to between 1765 and 1770 and was made by the Bow Porcelain factory in London. English porcelain from the late 18th century is very rarely found in Scotland and Bow Porcelain is particularly rare. Even more remarkable is that it was found within an industrial building on the site of salt pans on the Back Beach at Brora. This sherd is not alone; amongst the assemblage of other high status pottery finds from Brora, are sherds of Chinese import ware of similar date. How they found their way to Brora is a mystery! Brora has long been associated with the production of both salt and coal. The local coal was periodically exploited for making salt for nearly 300 years. Jean Gordon, Countess of Sutherland, initiated the industry in 1598, with her son John re-opening the works in 1614. These ventures were an early attempt at industrialisation in the Highlands and helped to elevate Brora to burgh status. However, the iron of the salt pans had to be sold in 1617 to pay off estate debts, two years after the death of the earl in 1615. The next phase of activity originated in the re-organisation of the Highland estates in the aftermath of Culloden in 1746. The lessees, Messrs Robertson & Co. from Portsoy, established trade links across the Moray Firth and continued to produce saleable salt until 1777. During this period, Brora was the tenth largest producer of salt in Scotland. In the early 19th century, the salt and coal industries at Brora were again revived by the Marquis of Stafford, but the abolition of the salt tax in 1825 sounded the death knell for the industry, even though the coal works survived until 1974.